The enterprise is more collaborative than ever. Industry leaders work fluidly with customers, partners and vendors to maintain their competitive advantage – while mitigating security risks to sensitive content. 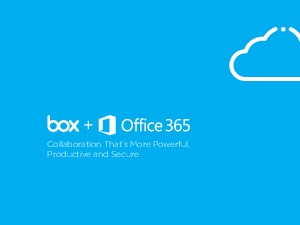 Box is built from the ground up to keep collaboration secure without slowing productivity. Folders and files become shared, secure workspaces where everyone has access to the right content, with the right permissions, without having to provision users or set up extranet sites. Box gives IT a global view of all content and robust policies for user access, so security and collaboration are always in balance.